Can I tell you how excited I am right now? For the first time in about two years, I can actually write a post from a bonafide computer! Our old PC died about three years ago, and though Darling would occasionally bring his laptop from work on weekends, I very rarely ever got a chance to work on it, since our tween was constantly commandeering it to play her online games (insert giant eyeroll here...). So today, for the first time in what feels like ages, I am actually sitting comfortably at a keyboard, and typing away instead of frustratingly hen and pecking on my ipad. When we first purchased our lovely home, I quickly found the perfect spot for my studio. A tiny room in our basement, far away from our living area, where I could hide all of my treasures and unkempt work surface behind a closed door. Fast forward a few years, pregnancy results in a gorgeous homebirth, infant becomes baby, baby becomes toddler, and Mom and Dad are finally seeing the light at the end of the tunnel, and are starting to put some serious thought into renovating the House. Starting with the basement. Which meant said basement needed to be cleared. So. What was I to do with all my stuff??? Baby was already sharing our room, so that means I either box it all up, or find a way to display it all in a tasteful way. I opted for the latter. I had been able to pull it off in our apartment, so, why not create a little 'long term, short term' spot for my Atelier upstairs? I knew this would involve some serious furniture juggling, but I finagled myself a nice little nook, if I do say so myself. Picking the area wasn't too difficult. I wanted lots of natural light (that part's easy, what with our floor to ceiling windows), and this bookcase, which was used as a very sorry excuse for an entertainment unit. It came with the house, and we think it was because the thing weights a TON, and they just couldn't budge it. The table by the window was what gave me the idea. So the next step would be to relocate all the toys & electronics, and then relocate all MY toys! All of this, and more, needed to be moved upstairs. And I had to do it all myself, because I'm the only one I trusted with my treasured beads! LOL! And so it began. I decided that wall-mounting those little parts cabinets would be a perfect way to keep all the beads and buttons away from Baby's curious little fingers. Safety first. 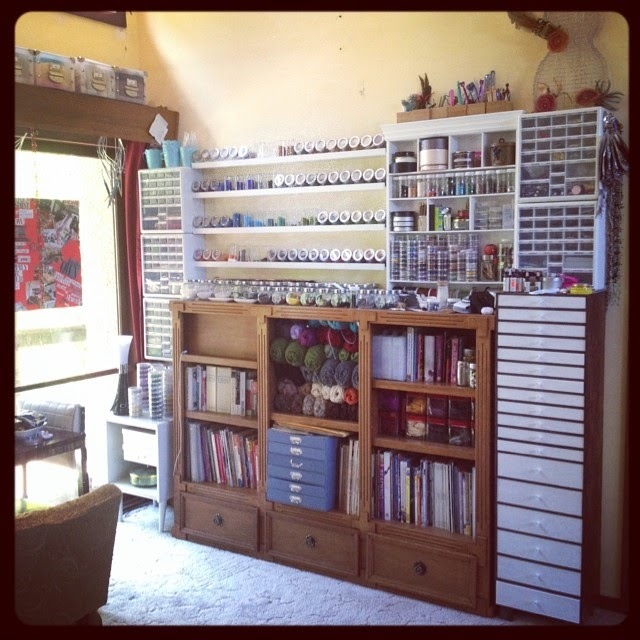 But there was still the issue of all my bulk beads and other materials. I wanted to use the vertical space as much as possible, it just made so much sense, especially with a toddler and cats. But I needed the right system to keep it all clean looking. IKEA to the rescue, where I found these awesome Picture Ledges, my little glass spice jars happened to fit perfectly on them. And my large wall organizer fit just right up there too. I couldn't leave well enough alone, the metal containers were starting to hurt my eyes, so I just had to get more of the glass ones, for a more cohesive look. Spent a whole afternoon decanting beads from one container to another, but I had so much fun doing it! And it looks so much better for it! 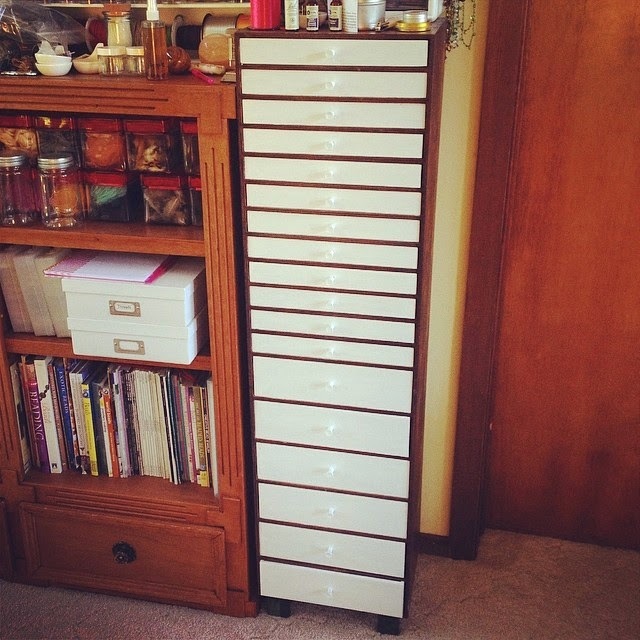 The tall tower of drawers on the right was a lucky find in a second hand store. Another IKEA creation, that is sadly no longer in production. I really disliked the colors, but nothing a coat of paint couldn't fix. Took me a few days of working through Baby's naps, but I finally got to this long-awaited project. I love me some DIY. And here it all is as of today. Even putting the wooden valance to good use to store away some of my (lighter) finished projects. I'm not done with this area, by any stretch of the imagination. This is just beads, buttons and threads. I've still got my whole yarn stash to consider. But I'll wait for another post for that. What I can say about all these changes is that having all of my materials out in the open like this have revived my desire to create. Hard not to when you see all of it like this. It's out of the way, clean and organized, and I love the way it looks.